The shoe is on the other foot. I hope Apple wears it well, because I expect it's a tight fit. Samsung is doing to Apple what the "Get a Mac" marketing campaign did to Windows a half-decade ago: Change perceptions, for the negative. Apple's ad campaign is one of the best conceived for tech products, using two actors to represent a Mac and Windows PC and convey simply complex concepts about why one is better than the other. That campaign crushed the Windows brand at a time when Microsoft delayed Windows XP's successor, which thumped on the market in late 2006 like someone flying fast and far from a trampoline. Samsung's "The Next Big Thing is Here" campaign -- squarely slamming iPhone and its idolaters -- similarly succeeds. So says YouGov BrandIndex, which measures consumer perceptions about products like iPhone. "Samsung has just edged past the iPhone in consumer perception in the US (adults 18+), likely powered by their new set of ads bashing the Apple fanboys who camp out for hours to buy the new iPhone," Ted Marzilli, BrandIndex managing director, says. I wrote about the first commercial the day after it aired (November 22), describing it as "among the best tech ads I've seen in years". I wrote about another in the "Next Big Thing" series on December 2; BrandIndex says it aired the day before. "The two snarky ads, which promote the Galaxy S II, appear to be affecting the iPhone’s consumer perception, sending it into decline around the time the first ad appeared and continuing now," Marzilli says. 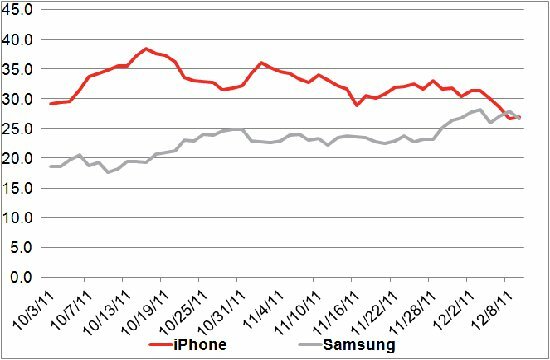 "At the same time, Samsung’s perception has crept up gradually and just surpassed iPhone last week. The ads were released around November 22nd and December 1st". He explains about the chart above: "iPhone’s buzz score began sinking around November 28, with a buzz score of 33 -- the current score is 25. Samsung, whose buzz score was 19 compared to the iPhone’s 29 on October 3rd, is now at 26". As I've oft said, in business perception is everything. In branding, perception is even more. Until Samsung's snarky TV commercials, only Verizon's "Droid Does" campaign offered any real challenge to iPhone, or perceptions about it. But Verizon didn't attack iPhone, which Samsung does with the kind of oft-hand cleverness that reminds of "Get a Mac". That's all without ever mentioning Apple or iPhone, even though the fake Apple-store look-alike and iPhone geeks waiting "30 hours" in line are unmistakable. 1. The TV spots are immediately familiar. iPhone fans waiting in line hours on end outside Apple Store is part of the cultural lexicon. It's a stereotype. 2. Casting is exceptional. These actors are believable iPhone idolaters. They are the stereotype. 3. Like "Get a Mac" there is delicious putdown -- many viewers will delight seeing obsessed, Apple hipsters made to look foolish. 4. Editing is exceptional, particularly the way jump cuts take the viewer down the line of people and interactions between them. 5. Samsung airs many different TV spots, and they're 15, 30 and 60 seconds long. 6. These ads get heavy rotation in prime time, like those for iPhone. 7. Each commercial, even the 15-sec spots, tell a story. There is a clearly communicated concept -- comparison between Galaxy S II and iPhone. 8. Samsung effectively communicates Galaxy S2 benefits over iPhone, while also emphasizing competitor's deficits. 9. The iPhone line waiters mainly are the ones saying the corporate brand name -- "Samsung", in an exasperated, stunned way that is more memorable than if a voice-over had done so. 10. The TV spots make you laugh -- the jokes are good.